Clothing which integrates solar power isn’t exactly breaking news. It has been done before and it’ll be done again. But frankly, we were yet to have seen such a cool integration of form and function such as with this Solar Powered Necktie. 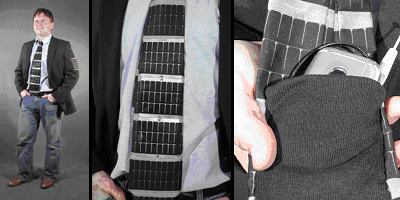 Designed by researchers at Iowa State University, whom have been working on inventing an effective use of photovoltaic textiles, sort of stumbled across this tie creation as they were figuring out ways to apply thier new founded solar fabrics. The really cool thing about this Solar Tie is that the pattern used for the solar shells sort of looks like a cool pattern that would be used on a tie anyway, so it’s really not too obtrusive into everyday life. The Solar Powered Necktie even contains a hidden pouch for stashing your cellphone away while the tie charges it up, using only the power of the sun. So you don’t have to walk around thinking that everyone will be glancing your direction to look at your inconspicuous clothing. The Solar Tie is a way to be green without looking like you’re trying too hard. While there certainly doesn’t seem like any immediate plans for mass marketing of a similar tie gadget, it seems like a truly great way for office workers to keep their devices up and charged while they type away and file their TPS reports. I might even consider wearing a tie to work. Which is sort of sad, since I work from home.